An iconic postmodern Kentucky Fried Chicken (KFC) outlet in Los Angeles has been severely damaged after a fire yesterday afternoon. Located on 340 North Western Avenue, in Koreatown, the restaurant suffered burns to its roof and walls. Los Angeles Fire Department spokeswoman Margaret Stewart told San Fernando Valley Media that 40 firefighters took to the scene, dealing with the fire in just over 30 minutes. No injuries have been reported; however, an investigation into the cause of the fire is still underway. The KFC was formerly run by Jack Wilkee, who took on the franchise to make changes to the restaurant, which he operated for 25 years. 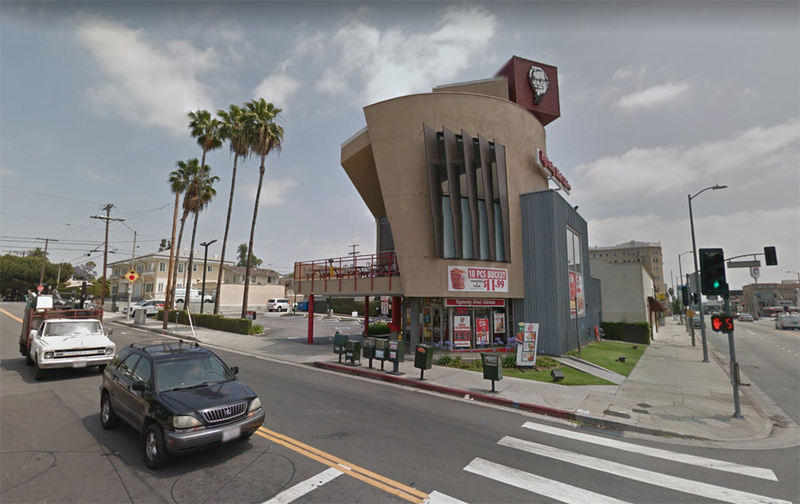 "I challenged the notion that all KFC franchises should have the same standard design of fake mansard roofs (and) outsize Colonel Sanders bucket," Wilke told the L.A. Times in 1990. "Why not do something radically different for a change?" To make such a change, Wilke, an art collector, sought the expertise of local architect Elyse Grinstein, who he knew from his art circles. Grinstein's influence, exhibited in her charred work, comes from Frank Gehry, her former boss, and Michael Graves, who was Grinstein's student when she was a teaching assistant at the University of California, Los Angeles. Wilke enjoyed Gehry's overtones that carried through in Grinstein's architecture so much so that he let her have free reign with the KFC's design. "I turned the design over to her, and let her have her head," he said. As a result, Jeffrey Daniels, Grinstein's partner and colleague at the Culver City practice Grinstein/Daniels, produced the Koreatown icon that many know today. "Jack (Wilke) wanted to do an updated Googie KFC," Daniels said, "but we convinced him to take it one step further and reinterpret the 1950s diner style in a more sophisticated 1990s idiom," Daniels said, also speaking to the L.A. Times 27 years ago. The design may have been the first KFC to break the formal mold that had been a precedent for KFC's before, but it certainly was not the last. Also in California, the Palm Springs KFC dons a Googie aesthetic. Meanwhile, in Georgia, the Marietta "Big Chicken" (which became a KFC franchise in 1991) sports a 56-foot-tall steel chicken, complete with a moving beak. The much-loved roadside restaurant recently received $2 million makeover. 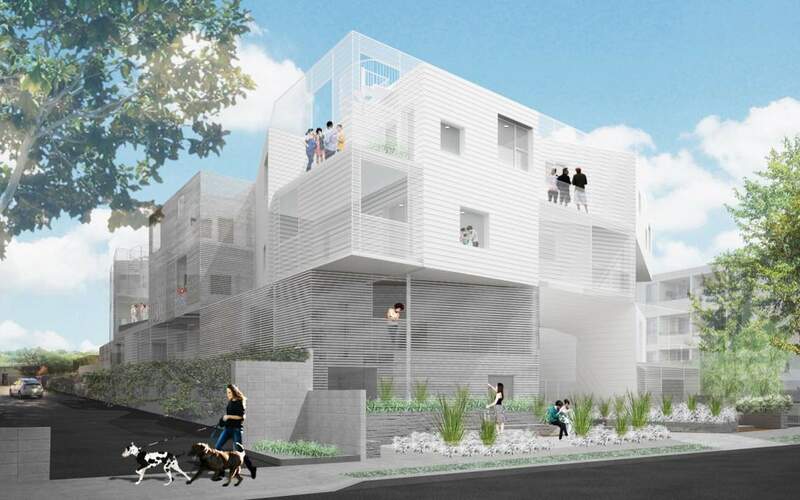 Architects Lorcan O’Herlihy Architects (LOHA) and owner National Construction have released renderings for a new 30-unit condominium complex in West Hollywood that features cantilevered corners, faceted facades, and perforated metal panel and wood cladding. The four-story complex at 1030 N. Kings Road is located in the same neighborhood as the firm’s much-heralded Habitat 825 complex. 1030 N. Kings Road is designed to break down in scale as it rises and features a series of geometric cut-outs along its facades. The cut-outs establish viewsheds for individual units while also allowing for natural daylight to flood into the building’s common areas, which include a shared gym and communal seating spaces. The cut-outs also contain screened outdoor balconies and terraces accessible to building units. The development’s two large amenity spaces are located along the building’s most prominent facades, which are wrapped in the various cladding types. Renderings for the project depict a faceted housing block with large windows, a double-height entry lobby, and well-lit corridors. The 41,500-square-foot project comes as LOHA expands its footprint in the L.A’s bustling multifamily housing sector. The firm recently completed work on a starburst-shaped apartment complex in Los Angeles. In addition to moving forward on the 1030 N. Kings Road project, Lorcan O'Herlihy will also be presenting at AN's Facades+ conference in Los Angeles this October. See the Facades+ website for more information. The project is currently under construction and is expected to be completed in mid- to late-2018. New York–based architects ODA and Miami-based developer Crescent Heights have revealed new renderings for a 70-story apartment tower slated for Downtown Los Angeles. 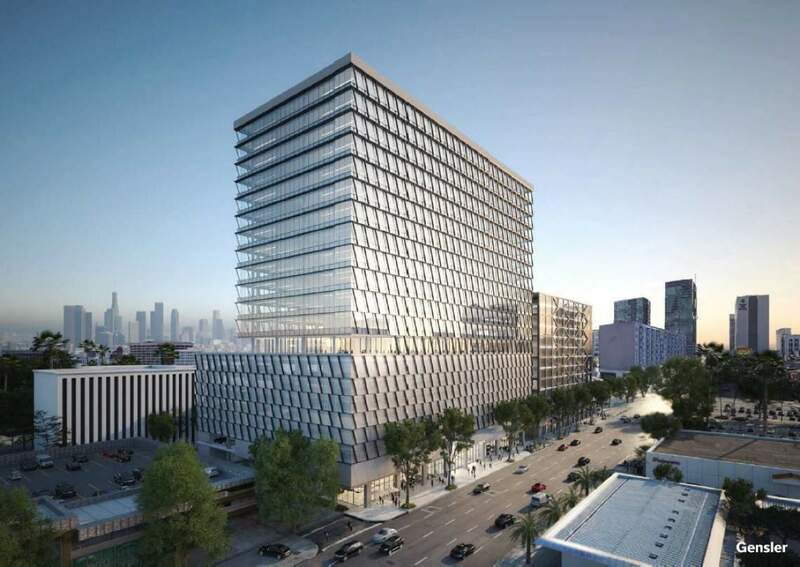 The mixed-use development will be located at the intersection of 11th Street and Olive Street; it aims to bring 794 apartments and 12,504 square feet of ground floor commercial space to downtown’s South Park district. The midcentury modern–inspired tower has been dubbed 1045 Olive and is being shepherded by the city through an expedited permitting process thanks to California’s ELDP program, a measure that guarantees sped-up approval for projects that invest over $100 million in the state’s economy. 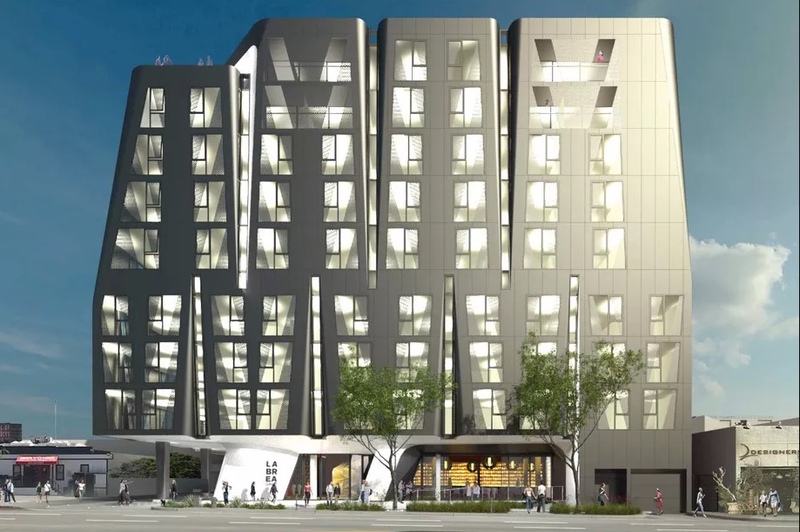 Renderings for the building depict a rectangular, flat-topped tower resting on a parking podium. The tower’s midsection is interrupted by a multistory amenity complex that features large corner openings several stories in height. One of the large cutouts along this area contains an outdoor pool and deck overlooked by glass-clad amenity spaces that include an indoor gym. The building’s conventional floors are wrapped in protruding wood-clad balconies in an effort to bring the outside indoors and challenge the standard thinking on residential tower designs in the downtown area, Curbed reports. The architects took an unusual approach with regard to the design of the parking podium, which is wrapped in apartment units that overlook the street. 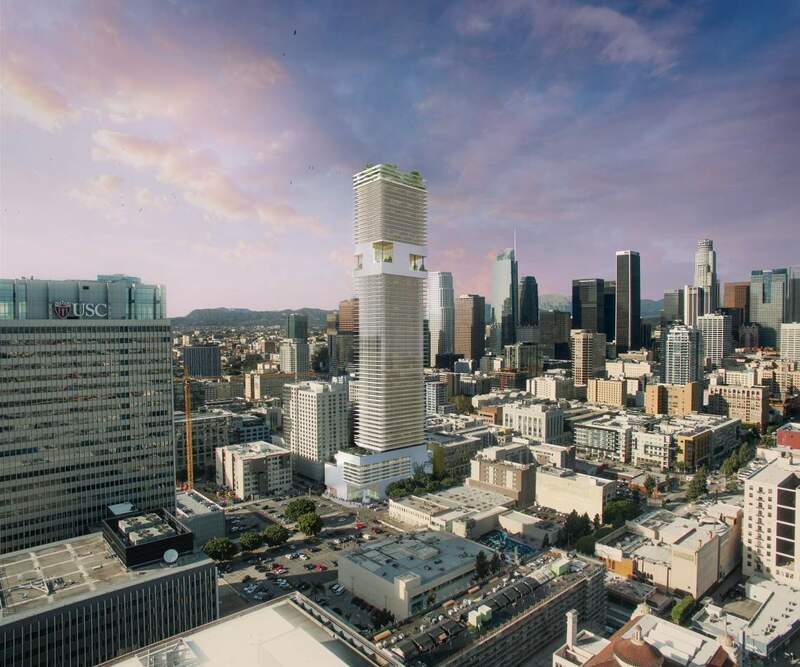 The tower, if completed to a height of 810 feet as currently designed, would become one of the tallest residential structures in the region, though it would fall roughly 165 feet below the recently proposed 925 S. Figueroa tower designed by CallisonRTKL. 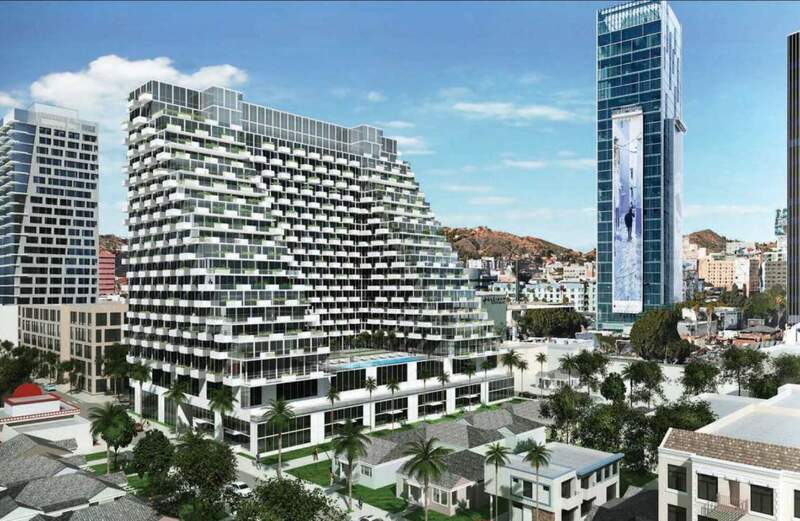 Developer Crescent heights is also working on a pair of other high-rise developments in the area, including the controversial Palladium Residences designed by Natoma Architects in Hollywood and the Handel Architects–designed Ten Thousand tower in Beverly Hills. An official timeline for 1045 Olive has not been released; see the project website for more information. Missed some of our articles, Tweets, and Facebook posts from the last few days? Don't sweat it—we've gathered the week's must-read stories right here. Enjoy! How green are Apple’s carbon-sequestering trees really? When the Apple's new headquarters is completed later this year, 8,000 trees, transplanted from nurseries around the state of California, will surround the donut-shaped building by Foster + Partners. But how much impact can one tree, or even 8,000 trees, make? The answer: Very limited or null. The untold story of Harlem’s gentrification and growth A new book from the Harvard University Press debunks the idea that the gentrification of Harlem was solely imposed by outside developers and investors. Why everybody’s mad at Anish Kapoor Did Anish Kapoor cunningly plan this controversy over the world's darkest engineered material as performance art? To spark a debate about artistic freedom? It could also just be old-fashioned feud. 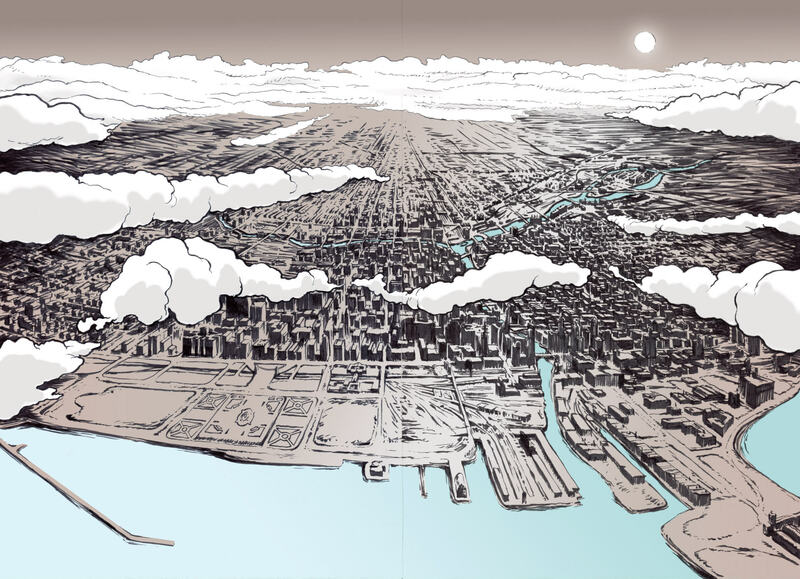 This graphic novel aims to shape Chicago’s next generation of city planners The Chicago Architecture Foundation’s latest venture is an educational graphic novel about urban planning and its challenges. While the book—titled No Small Plans—raises questions that aren’t new, it serves as an introduction for its target audience, namely children in grades six to ten. 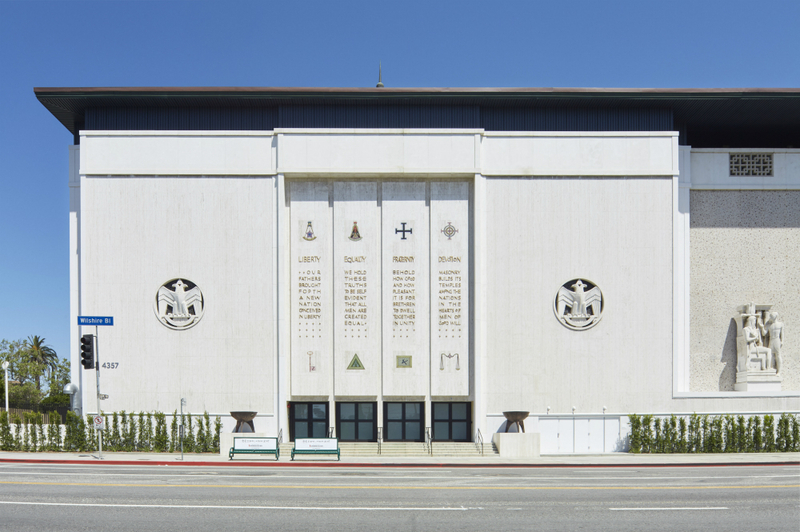 Koning Eizenberg combines symbolism and craft for a new chapel in Hollywood It took decades of piecemeal construction—a new day school here, a dank brick chapel there—to build the Temple Israel of Hollywood (TIOH). But it would require 10 years of work by Koning Eizenberg Architecture to transform the 90-year-old Spanish Colonial Revival–style temple into a flexible and social campus for worship. 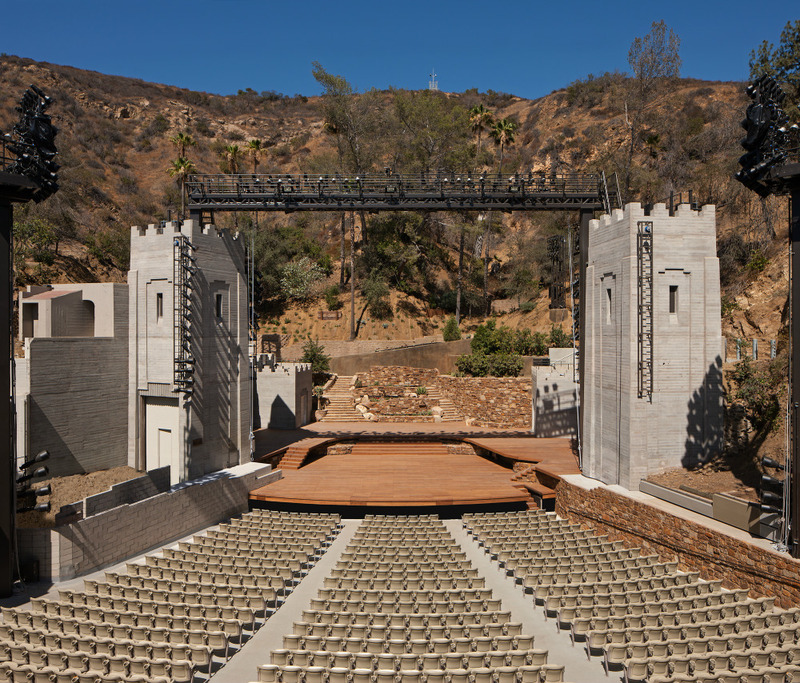 The newly upgraded and renovated John Anson Ford Amphitheatre in Los Angeles is making its official debut this weekend following nearly three years of construction. Levin & Associates Architects acted as design architect while Mia Lehrer + Associates (MLA) performed landscape architecture services on the $72.2 million project; both firms are based in L.A. The 1,200-seat outdoor amphitheater complex was originally built in 1931 as a replacement structure for a previous theater that had burned down. The complex—then known as the Pilgrimage Theatre—was built out of masonry to resemble the fabled gates of Jerusalem. The original complex utilized rough, board-formed concrete surfaces throughout, with smoother treatments deployed across the crenelated towers and walls that make up the theater’s stage areas. 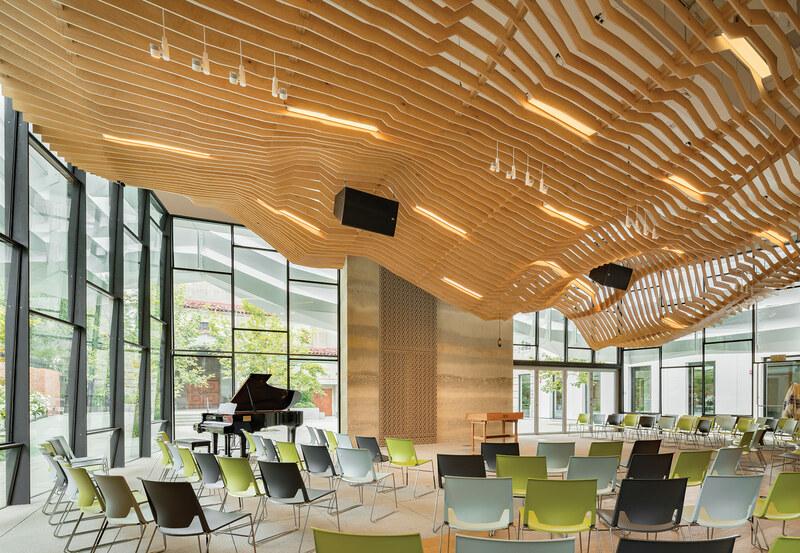 The completed renovation brings a new two-story, 11,055-square-foot concessions and office structure to the complex that includes a commercial kitchen, new projection booth, control room, and a series of catwalks designed to optimize new stage lighting upgrades. The renovations also carved out 3,500 square feet of “found space” from underneath the stage. The removal of the underlying bedrock allowed the design team to address rampant drainage issues—The stage is embedded into the hillside site, an arrangement that resulted in storm runoff rushing directly into the complex’s basement levels. Levin & Associates also added ADA-compliant artists’ spaces, including accessible restrooms and dressing areas, as well as new telecommunications systems. MLA has reworked the hillside landscape behind the stage to introduce a native “generational landscape” that will age gracefully in place and is designed to be held in place by a series of retaining walls. The landscape architects also added a series of mature tree specimens to the site, including two mature coast live oaks and two strawberry madrone trees. The amphitheater area is wrapped in a modular acoustical metal panel wall assembly that is designed to keep sound from performances inside the complex while deflecting the traffic and noise of the nearby Interstate-101. The entry and approach areas of the complex were also reworked to be ADA-accessible. 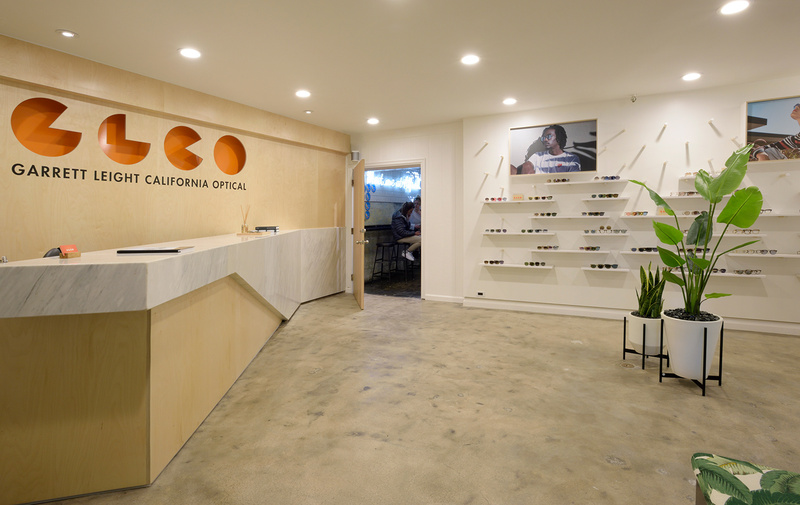 Los Angeles– and Portland, Oregon–based architecture firm West of West recently completed work on a 400-square-foot pop-up shop for optical and sunglass retailer Garrett Leight California Optical (GLCO). The store is located behind Alfred Coffee & Kitchen in the Melrose Place shopping center in West Hollywood, California. The pop-up shop includes birch-wood-clad interior partitions as well as typographic murals by design studio Cool August Moon. Designs also include a specialized display wall made up of white wooden pegs that support shelves and handheld mirrors. The store is open through the end of June.